Would that I could persuade all men to be devoted to this glorious Saint [St. Joseph], for I know by long experience what blessings he can obtain for us from God. I have never known anyone who was truly devoted to him and honored him by particular services who did not advance greatly in virtue: for he helps in a special way those souls who commend themselves to him. It is now very many years since I began asking him for something on his feast, and I have always received it. If the petition was in any way amiss, he rectified it for my greater good . . .
First, because Jesus Christ loved him not only as a friend, but as a father, and on this account his mediation is far more efficacious than that of any other Saint. Second, because St. Joseph has obtained special power against the evil spirits, who tempt us with redoubled vigor at the hour of death. My friend, that which you seek from Joseph can only be found in Jesus Christ. "But I am afraid that just as Eve was deceived by the serpent's cunning, your minds may somehow be led astray from your sincere and pure devotion to Christ." "I am saying this for your own good,... that you may live in a right way in undivided devotion to the Lord." It is now very many years since I began asking him for something o­n his feast, and I have always received it. The children of the world are ignorant regarding the privileges and rights which the Most High has conferred o­n my holy spouse, and the power of his intercession with the Divine Majesty and with me. Who will bring any charge against those whom God has chosen? It is God who justifies. Who is he that condemns? Christ Jesus, who died--more than that, who was raised to life--is at the right hand of God and is also interceding for us. is able to save completely those who come to God through him, because he always lives to intercede for them." 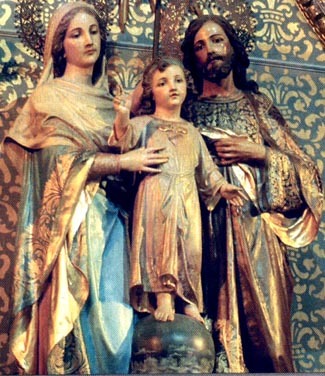 "My little children... we have an advocate with the Father, Jesus Christ the righteous:"
because St. Joseph has obtained special power against the evil spirits, who tempt us with redoubled vigor at the hour of death. 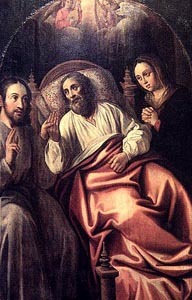 the assistance given St. Joseph at his death by Jesus and Mary obtained for him the right to secure a holy and peaceful death for his servants. "But God demonstrates his own love for us in this: While we were still sinners, Christ died for us. Since we have now been justified by his blood, how much more shall we be saved from God's wrath through him! I appreciate you taking the time to find this link for me. As it is a rather lengthy document might I begin by asking what I should be looking for in it? On initial impression it seems it is telling me that it is heresy to belive that one is complete in Christ alone. "Chancellor More finds nothing wrong in the food offerings offered to St. Germain"
You read and undertand what you want. The dialogue discusses how the Lutherans have destroyed the faith; people stopped praying and fasting and became immoral. Tyndale's translation was malicious in that it attacked the church more than it was faithful to the Word. The Reformers' anger against Rome and pride in themselves got the best of them and they failed in Charity and Grace, preferring to destroy and setup their own do-it-yourself style of religion. You and I are truly living on different planets. Are you claiming that all of Christendom outside of the Catholic Church is immoral? Tyndale was burned alive (contrary to the words of Christ) for trying to bring the Bible to the common people! No. But any study of the Lutherans during those days will surely reveal and attest to this. Their theme of "Faith Alone" ripped out Charity and Hope from the Gospel message. And why? To do damage to the Church. They went overboard in their zeal against her. Actually, Tyndale was strangled, then burnt. Examples please!!! My goodness!! What examples do you need! Tyndale, in More's words, was a beastly man with a brutish mouth. Is that how Christians are to be known?